With all the ‘2012 end of the world’ nonsense floating around at the moment it seems fitting to return to the last time popular culture got itself into a lather over what is, essentially, a meaningless date. Back in the late 90s, society had a diabolical case of PMT – Pre-Millennial Tension. There was a distinct feeling that on January 1st 2000 something would happen, and probably something not very good. Of course this feeling was reflected in the cinema and there was a rash of films depicting the end of the world. Most apocalyptic films follow a certain formula: normal, audience-relatable person uncovers threat to the world; said person is not believed or trusted by the authorities; special effects ensue; eventually said person convinces all how serious the situation is and joins the army/government/scientists to save the day. It’s a cliché that’s been repeated ad nauseum, so it’s particularly refreshing and interesting to come across an apocalypse film that doesn’t follow that pattern. 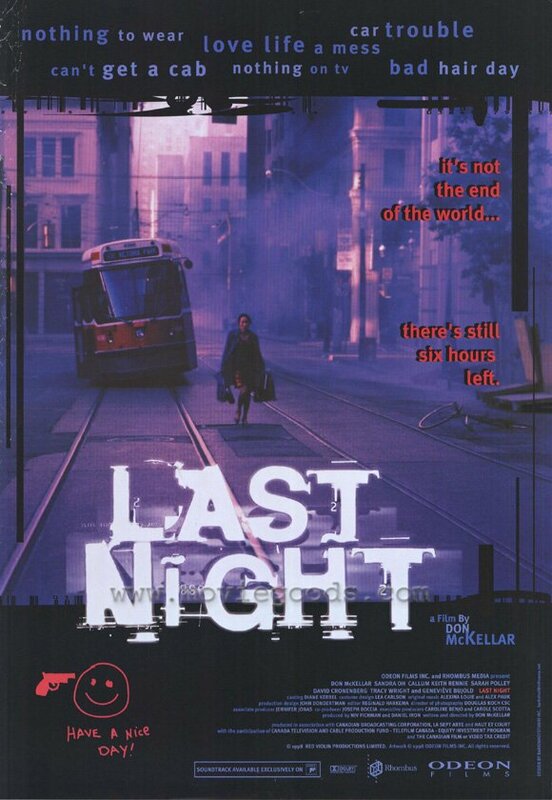 1998’s Last Night uses the end of the world as a background plot device. The focus is not on any attempt to save the world, indeed people in the film have known the world is going to end for some time and have come to accept the fact. Instead the apocalypse is simply a MacGuffin: it forces the characters to think about their lives, their desires and the decisions they’ve made. Yes, despite its apparent sci-fi trappings, this is another staple of that very 90s genre; low-budget indie flick featuring twenty-somethings moaning about their lives! Last Night is set in Toronto during the final hours of the world. The film follows several characters, all linked in some way, as they prepare for the end. The film, very much the vision of its director, writer and main star Don McKellar, isn’t perfect but its premise has a power that draws you in. By taking away any chance of saving the world and ignoring the great and good for ordinary people (something it shares in common with another apocalyptic film we covered, The Day The Earth Caught Fire) it makes you think about what you would do in that situation, about your life. It certainly had an effect on Lewis and I, leading to the kind of conversations that really should only be had at 3:00am after a couple of bottles of red. This week’s deliberate error – we forget to mention who recommended the film. It was Eoin Boyle. Thanks Eoin, hope we did you proud. Also, here’s a little game for our listeners. One of us is wearing a suit and tie during the recording. Can you guess who?